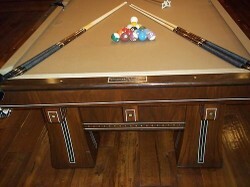 Antique billards tables are the perfect game room center piece. A fun game to play and a magnificent piece of furniture to look at! Here's a great selection of beautiful antique billiards tables for your home decor. Many of the antque billiards tables showcased here were found in the pool and billiards parlors of the 19th Century and early 20th Century. You'll love creating a space around them that harkens back to those special times in American history. Kasson, Brunswick, and Connelly pool tables were the prominent brands both then and now. All of the antique pool tables shown here are for sale on ebay, one of the most popular and trusted shopping sites in the world. CLICK HERE to see all of the antique billiards tables available on ebay today. Gone are the days when a pool room is a place for men to escape women. I actually met my husband playing pool, and we gave each other an antique pool table as a wedding gift. Then we had to buy a house that was big enough to hold the pool table. And that's how we ended up in our huge fixer-upper 18th Century farmhouse. It was big enough for the pool table and we could afford it. Old houses ramble and they have these spaces that's aren't quite hallways and aren't quite rooms. We have one on our first floor that some might call a foyer. But it's not really that either. But nonetheless when you enter our house, our antique billiards table is just about the first thing you see. Some think they've entered a pool hall because we've got small bar tables and chairs so people can enjoy food and a drink while they watch others play pool. I've decorated it with old Coca Cola signs and other vintage advertizing so you do sort of feel like you might be in a dive. Buy Antique Billiards Tables on ebay! Oh my gosh if you want a very special antique pool table, then take a look to the right to see some fabulous selections from the 1800s. Some of them have been restored and look like new. Others have been allowed to show some wear and tear for authenticity reasons. It's your choice which you prefer. Our very ornate pool table came with chips and dents and so far it's been left like that. It sort of matches its room which we haven't gotten to yet. So the result is that it looks like a down and out pool room. While we have a restored version in our heads, the threadbare reality has sort of grown on us. Even our friends love the vibe and hanging out. It might be because no one has to worry about spilling anything in the heat of a competitive moment. I don't worry about mixing decades any more than I worry about matching furniture styles so in addition to the antique coke signs we recently added an vintage coca cola machine - that actually works. Matt (my husband) is an electrical engineer. He found the old coke machine in back of a deserted general store and got it really cheap. After realizing how hard it is to find coke in antique coke bottles he retooled it to dispense modern cans of coke. It looks so spiffy! The massive size of antique pool tables with their amazing designs does give any room a focal point. Even the most hapless newbie, can't help but want to pick up a cue stick and start playing. Another reason for not rushing to restore it - especially the felt playing surface! Best to wait until almost all of the people you know have learned on another table. But wouldn't you know that that was something we did fix. Because well, it is a pool table and we wanted to be able to play a decent game of pool on it. It's been repaired several times since then. But when the Red Sox are playing and they're actually winning, things can get very raucus! There's no such thing as throwing a party and not having people have a good time when you have a pool table. Even those who don't want to play, can stand around and cheer. It gives the relatives something else - other than politics - to talk about. That's a very good thing. Billiard Table for Sale on ebay! More Antique Home Decor for You to Love! Shop this great selection of antique corner cabinets in built from beautiful mahogany wood in many different styles. You'll love the prices! Extraordinary selection of Duncan Phyfe antique couches and sofas. Show off your collectibles in style when you add an antique mahogany curio cabinet to your home decor. Antique barber chairs and used barber stations bring us back to a friendlier time when men spent time talking and laughing while they waited for a haircut and shave. It's great having an antique that you can enjoy using everyday. These are beautiful pool tables. I left an antique pool table with my ex when we got divorced. Metal tin signs have a fantastic vintage vibe. They come in lots of colors and sizes, so you'll always find the perfect one for any space. Add instant Old World Charm to your home when you put stained glass in a window or door.